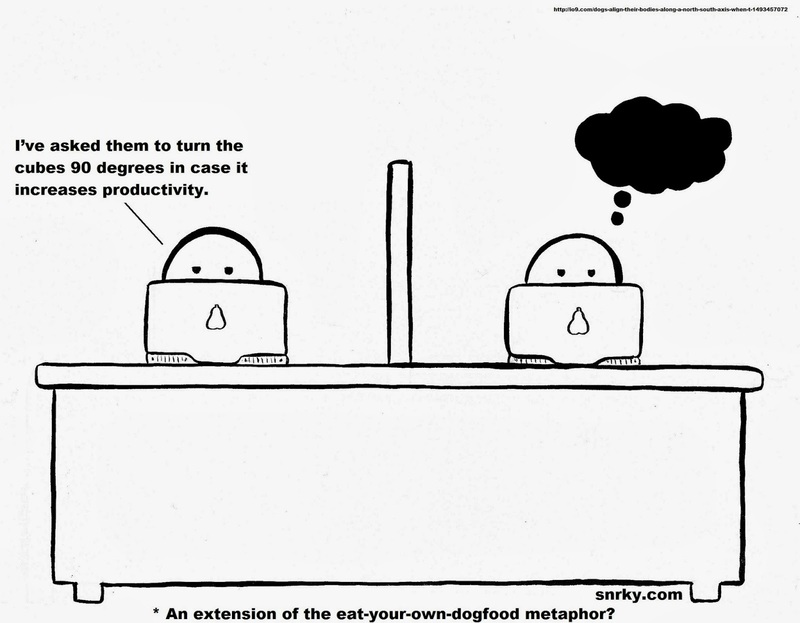 Snrky: An extension of the eat-your-own-dogfood metaphor? An extension of the eat-your-own-dogfood metaphor? Snarky: I’ve asked them to turn the cubes 90 degrees in case it increases productivity. Title: An extension of the eat-your-own-dogfood metaphor? "The editor of IEEE Software recounts that in the 1970s television advertisements for Alpo dog food, Lorne Greene pointed out that he fed Alpo to his own dogs. Another possible origin is the president of Kal Kan Pet Food, who was said to eat a can of his dog food at shareholders' meetings. In 1988, Microsoft manager Paul Maritz sent Brian Valentine, test manager for Microsoft LAN Manager, an email titled "Eating our own Dogfood", challenging him to increase internal usage of the company's product. From there, the usage of the term spread through the company"
"Ever wonder why dogs need to get themselves into just the right position to do their business? As it turns out, dogs align their body axis according to Earth's magnetic field when they squat to poop—a behavior that changes when the magnetic field is unstable. But why do they do it?"